The Meal Kit Industry is constantly changing. Over the last few years many new companies have been established. There are now so many options available that if you are interested in trying the services of a meat kit company, it is difficult to know which company is the best match for you. Two of the more established and better-known companies in the meal kit industry are Blue Apron and Hello Fresh. They have a lot in common, but there are a few important differences which I would love to share with you. So, let’s dive into a comprehensive comparison right now! Veggie Plan which is ideal for 2 or 4 people with a choice of 3 recipes per week. The Classic Plan for 2 people provides either 2 or 3 dishes per week. The Family Plan for 4 people, which provides 2-4 dishes per week. 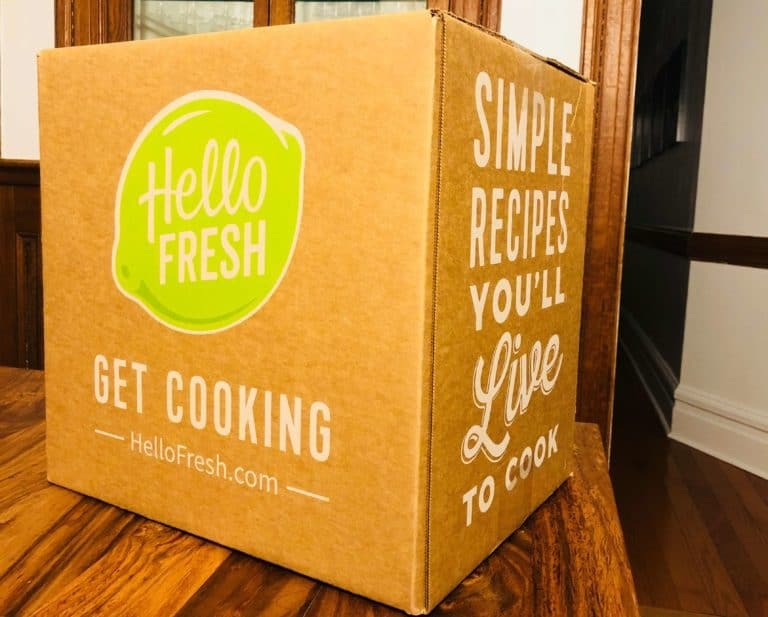 Hello Fresh offers a total of 16 recipes per week, divided between their different plans. There are 8 in the Classic Plan, 4 in the Family Plan and 3 in the Veggie Plan. 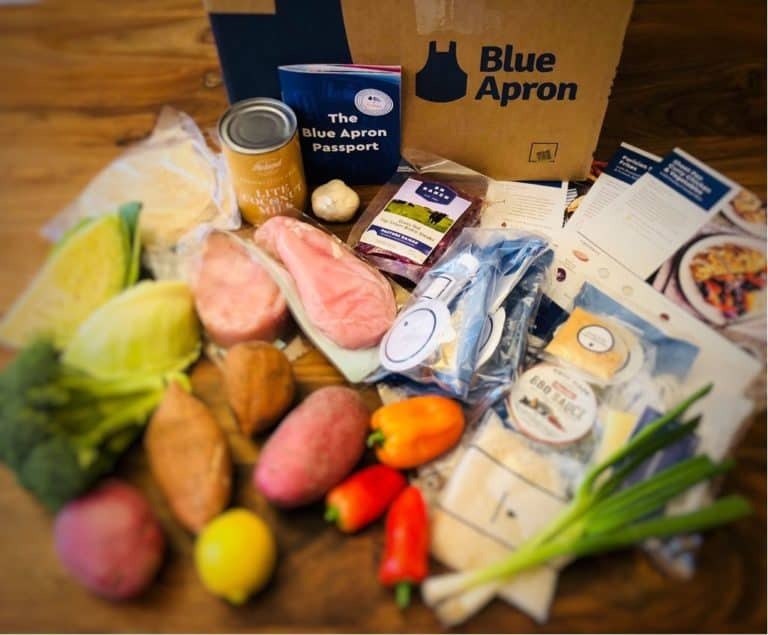 Blue Apron offers a selection of 12 dishes per week. These are divided between their two plans – 8 dishes for the 2-person Classic Plan and 4 dishes for the Family Plan. With both companies, you are able to change plans from week to week. The diversity in both companies menus is great – vegetables, beef, poultry, seafood & pork, so there are certainly many different dining options for you. Both companies offer great diversity – vegetables, beef, poultry, seafood & pork – there are certainly many different dining options for you. After experiencing both Blue Apron and Hello Fresh, we can confidently say that every dish we tasted was delicious! 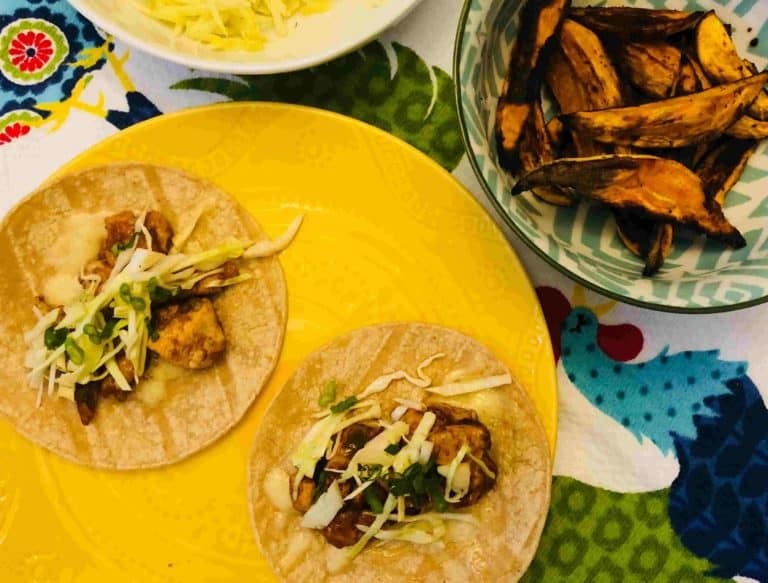 we do feel that Hello Fresh tries to focus on classic and known dishes using well-known tastes and flavors, but still keeps it fresh and add some new and interesting twist in most dishes. 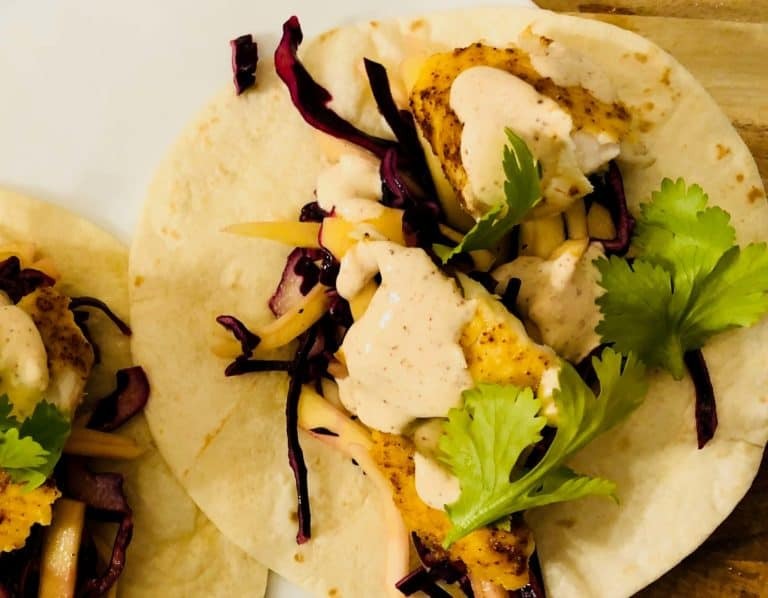 The Hello Fresh recipes do not involve any sophisticated or difficult cooking techniques which is a lot less intimidating for many people. In comparison, Blue Apron appears to offer slightly more sophisticated options that allows some more involved cooking techniques. This is a great option if you are more confident in the kitchen and have some more spare time for evening cooking. Both Blue Apron and Hello Fresh generally provide high quality products. Blue Apron uses farm fresh seasonal products which are sometimes organic. They state that all meats have no added hormones and all seafood is sustainably sourced. Hello Fresh used meats that are primarily sourced domestically. They make a promise that all poultry is both antibiotic and hormone free. Their pork is certified to be hormone free, and all seafood is sustainably sourced. It is important to note that the vegetables provided by Hello Fresh are not always organic, but they do state that their focus is not on whether or not the produce is organic, but rather that they are trying to help the customers take the necessary steps to include more fruits and vegetables in their daily lives. The boxes I received from both companies were aesthetically designed and labeled with the company name. There is however a big difference between the companies once you open the box to check your delivery. 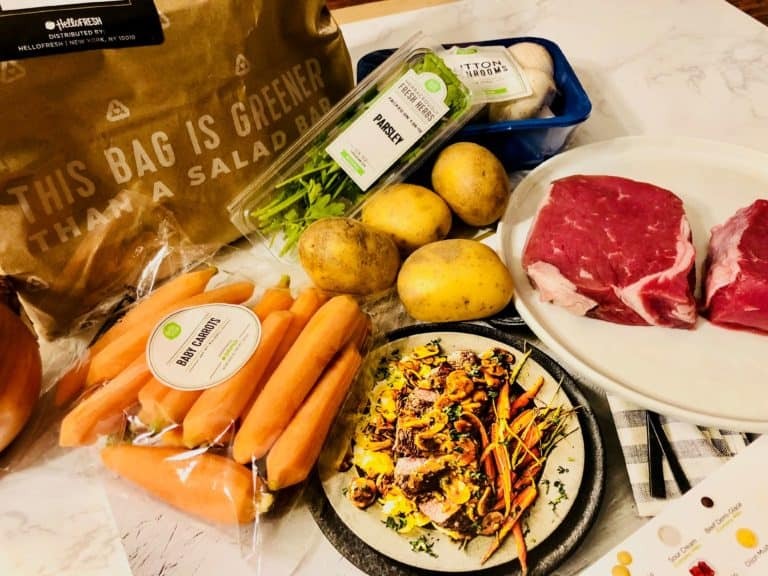 Hello Fresh send the ingredients of each dish individually organised and labeled in a transparent plastic bag. With Hello Fresh it is simply a matter or storing the separate meal kit ingredients appropriately as all the sorting has been done for you. 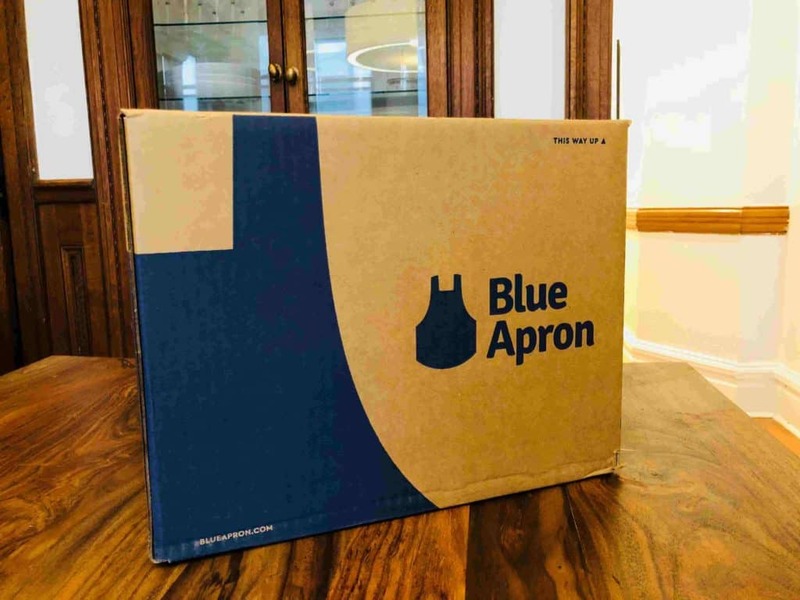 This is opposed to the delivery of Blue Apron which has no labels on most of the ingredients and they are seemingly all scattered inside the box. The only items that are packaged separately are small ingredients like spices, vinegar etc for each dish. This means that you must sort and match the ingredients of each recipe by yourself which can be a time-consuming process and is an important consideration when making your selection, but it really takes only few minutes. Both companies offer well-organized and easy to use website and apps. You can register, specify your eating preferences, select and change plans and dishes, change your payment method etc. All of this can be completed online in a very easy and practical way. You can also see past recipes and future menus, including the recipe, ingredients list and additional nutritional information for each dish. The service of both companies is a subscription service, with the option to skip weeks very easily if necessary. They also both offer some flexibility in selecting your preferred delivery day. If you wish to cancel the account, you can do this online with Hello Fresh. With Blue Apron you need to contact customer support to deactivate your account but they reply very quickly. Hello Fresh offers two different add ons – the first one is a handy selection of kitchenware – like prep tools, cooking ware, knives, storage solutions etc. The second one is a monthly wine monthly subscription, at a cost of $89 for a selection of 6 wine bottles per month. You can choose between red, white or mixed with the wine plan. Blue Apron offers very similar add ons .They have a lovely selection of wines with the option of matching the right wine to each dish, which is great! They also have a retail option, offering all kinds of cookware and other kitchen supplies. Both are very good options and offer a great way to upscale your dinners. Each company appeals to a bit different audience. Hello Fresh, our own favorite, is for people who desire familiar dishes with great flavors and some new touch, yet very easy to cook and not too complicated. Blue Apron appeals to people with passion for cooking, who would like to experience new challenges in their kitchen. Our winner in this battle is Hello Fresh, mainly because our team liked the taste of their dishes better. Also, we loved the fact that they make an effort to keep the cooking not too complicated and long.